It’s possible to raise a large, well-balanced family in Singapore – just ask Joshua and Joanne Sng, who make it look all too easy. 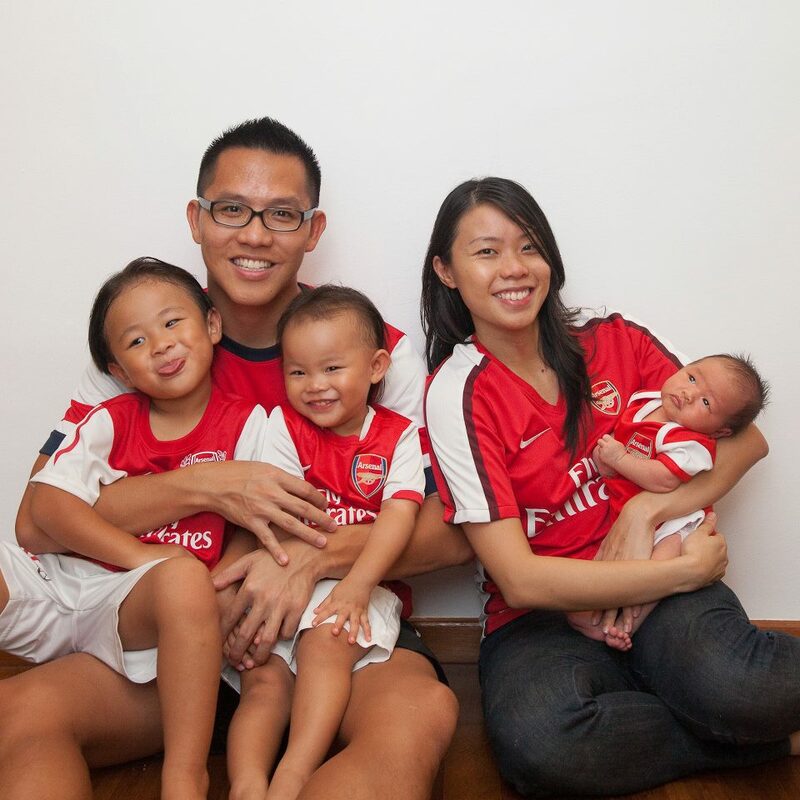 The Sngs, by many accounts, make a picture perfect family, especially when all five are kitted out in identical Arsenal jerseys, the favourite team of mum Joanne and dad Joshua. Their oldest, Josiah, is four going on five, and already coming into his own as the big brother of the household. When he and his younger sister Joanie return from childcare each day, he helps remove her shoes and is on hand to provide towels and tissues when his parents change her. “He’s very involved in the running of the household, as much as he can be as a four year old,” said Joshua, 34. Youngest child Joash is just seven weeks old, and the 31-year-old Joanne, who works for a boutique public relations company, works from home so she can take care of him. In a country where many are delaying having children and the Total Fertility Rate last year was a paltry 1.2, Joanne and Joshua are happily bucking the trend. The couple, which got married six years ago, want a total of four kids. “We wanted it to be balanced, and two didn’t seem like a lot. We believe that joy comes from family and relationships, where there is true meaning in life,” said Joshua, who teaches at Dunman High. Family life is as real as it is rosy. Joshua and Joanne describe themselves as ‘pretty thrifty people’ – the couple, who do not indulge in big-ticket purchases and keep their vacations within Southeast Asia, did not have to make any significant lifestyle changes when they decided to have kids. They do not own a car, so every morning mum walks Josiah and Joanie from their Marine Parade home to childcare. The centre, Just Kids, costs a ‘reasonable’ $800 for each child per month, says Joanne, in comparison to pricier alternatives that can cost up to $2000. Even then, government subsidies help – they get a hundred dollars off each child’s monthly fees. The couple has received a total of $16,000 in baby bonuses for their three children ($4000 each for Josiah and Joanie, and $8000 for their third child Joash), and agrees that the extra cash is exactly that, a ‘bonus’. But although the money is welcome, it had ‘zero impact’ on their desire for children, avers Joshua, a hands-on father who is every bit as involved in parenting as his wife. For the couple, their biggest reward is not monetary, but living in a house full of mirth and warmth. When eldest son Josiah tries to carry his sister but they end up tumbling to the ground unhurt, the whole family laughs along. “The kids always do things that make us happy,” said Joanne, who enjoyed 16 weeks of maternity leave when third child Joash was born. And when the couple witnesses Josiah giving up his sweet for Joanie when she has dropped hers, or picking up her toys after playtime, they know he has picked up important lessons of self-sacrifice.